My grandmother was the Queen of Sheba, and I first grandchild and namesake, was her princess. My grandmother was the Queen of Sheba and I, first grandchild and namesake, was her princess. I had a special circle around me which repelled her suspicions, her grudges, and her immutable conviction that the entire world was low class. I knew that Yiayia no longer spoke to half the congregation of Agios Vasilis Church in Atlantic City. I knew she rarely spoke about her other granddaughter who had a slight limp due to cerebral palsy. I also knew that my father had spoken of the strap that hung on the kitchen door. None of it mattered to me; greedy for love I lapped up her affection. A block away was my Uncle Pete’s restaurant. Pete had gotten into disfavor with Yiayia because he married a Danish woman but when he opened the restaurant, Yiayia saw it as a sign that he coming back to the good people. She decided to help him. Uncle Pete told her that she didn’t have to do anything at the restaurant and tried to persuade her to stay home but Yiayia was magnetized to that place, especially the cash register. I usually sat at the counter and drank hot chocolate and Yiayia would stand at Uncle Pete’s elbow and keep a stream of Greek flowing. The little I understood was “prosohi,” (careful), that’s a twenty, or prosohi, that one looks fake. Once Uncle Pete got so angry that he told her to go in the kitchen. A little while later we heard this big fusaria and then Yiayia’s voice saying loud enough for the whole restaurant to hear. “What you crazy? You gotta put him, Mint, the meat he need mint, no oregano, MINT.” The cook flew out of the restaurant and took Uncle Pete outside. He kept gesturing with his hands wide open as if he were pushing all the mint in the world towards Yiayia. Even to my ten-year-old understanding it was clear that the conversation was “either she goes or I do.” Uncle Pete came in coolly, asked me if I had to go to the bathroom and then immediately told Yiayia that I had to go and she should take me home immediately. I knew that Yiayia never would let me go to the bathroom at the restaurant and I was the diversion to settle the fusaria of the day. I was proud to play my part. Part of the reason that I was her princess was that my father had moved out of Atlantic City to the suburbs and was on his way to becoming a very big deal business man. Yiayia called our house a palace. My mother was also not Greek but somehow six bedrooms and a swimming pool assuaged Yiayia’s wrath. The one thing she couldn’t abide was my mother’s bland cooking. Neither could I. When Yiayia and Papou visited and I saw all these brown wrapped parcels, the saliva started flowing. The Greek peppers burned my head off, the feta cheese was tangy in my mouth but what I really hoped I would find in the bags was a jar of honey. That meant that she would make loukoumathes for sure. The fried dough balls drenched in honey were so time consuming but whenever Yiayia made them I hung around the kitchen even on a nice day, like a puppy dog. When she said ‘Ella” (come) and put the finishing flourish of cinnamon on them nothing could disturb my pleasure. If it were on a weekend my father would wander in from the library and sit down with us and she would make him a Greek coffee and there, in our white suburban house, we had our own cafeneon. I had never been to Greece but if this is what it tasted like it was the place for me. I asked Yiayia why she didn’t go back to Greece. She told me that Greece was no good now there was too much monkey business. I later found out when I got to know my relatives there that they had made the unpardonable mistake of not realizing the Queen was among them. So Yiayia lived in her memories of Greece and with the ‘good’ people of the Atlantic City Greek community that she spoke to. It was a big enough village for her. I grew up and not unexpectedly began to take care of Yiayia as she had taken care of me. Her imperiousness kept her going and she outlived both of her sons and her husband. It freaked me out to visit her in the retirement community where our name was listed on the registry. Then when she could no longer keep house for herself she made a tour of nursing homes in the Atlantic City area. It seemed like every other month I drove from NYC to Atlantic City to move her into a different facility. She broke her wrist and went into a convalescent home. After two months there, she saw the bill and made a fusaria that even agitated the Alzheimer patients. She called me to take her to her grandnephew whom she had brought over from Greece. She told me he was a good boy but she was paying him so he didn’t feel there was any monkey business. His house had steps and Yiayia could only navigate them on her popo; that sojourn only lasted a few months. She went back to a Catholic facility and seemed content there. She allowed the nurses’ aides to watch soap operas on her little television and kept watch for any monkey business in the place. Every time I visited she was full of stories about old men wandering into the women’s rooms. She clucked and pawed-pawed, revolving her hand in the archetypal Greek gesture meaning you can’t imagine the trouble I’ve seen, but I suspected that secretly she was delighted with her command of the situation. She was one of the few residents with all her marbles. As time went on I got a quick education in the downward spiral of age and thought I might be spending most of my life on the Garden State Parkway. It amazed me how quickly I had gone from being her little princess to being the Prime Minister in charge of her care. Then I found a Greek retirement home outside of NYC and thought it might be a solution. The retirement home was located in Mount Vernon just north of New York. By this time, Yiayia had a variety of ailments. Her legs were terribly arthritic and even with a walker she could only move at a snail’s pace. The driver helped me haul her and the wheelchair out of the car. Her legs were so rickety but she was trying her best to walk. We went through my lobby and in the elevator up to the sixteenth floor to my apartment for a bathroom break. The walk down the hall from the elevator took twenty minutes but Yiayia wouldn’t use her wheelchair. The retirement home in Mount Vernon stipulated that residents had to be able to walk to be accepted. She wanted the place to work out. It was cheaper and nearer to me. Then back down in the elevator, into my car, and off to Mount Vernon for our interview. The Greek home was easy to find and it looked nice and clean. Yiayia said she was sure it would be all right because although God was one, she suspected those Catholics of charging too much money. The Greeks, she said, understand that people can’t pay a fortune for things. A nurse came and said that the Director would see us. We got up and then saw his office was down a flight of stairs. I was ready to turn back but Yiayia got that gleam in her eye. Although, I was pretty sure that she had no intention of staying at Mount Vernon Retirement Village, she was going down those stairs to tell the Director face to face that she wouldn’t be gracing his establishment. Dr. Pappas spoke perfectly good Greek but Yiayia launched into her eccentric English as proof of her unsuitability for this no count village establishment. “Sir, you make me to wait. Father Vasili say me this house was good place with good people. He know my family from many years but I see monkey business and tricky people with dirty suitcases.” I had never heard that one before and thought it must have been some code from her days of renting out rooms to boarders. Dr. Pappas spoke very softly in Greek and then switched to English and tried to steer the conversation to her health and if she could walk up the stairs but Yiayia was not capitulating. “Stairs he don’t matter, I go with my own people. This place is not for people from good family.” Dr. Pappas then proved himself a true gentleman and extraordinarily kind. He reached out and took her hand and said “Madame, I think that someone of your breeding would not be content here and I am terribly sorry that we won’t be able to have you with us.” She turned to me and whispered, “See this person know I am good people from good family.” She beamed at him and then suggested that he warn people in the dining room to clean up their language. Dr. Pappas said that it was an excellent suggestion and called the two kind men from the kitchen whose aprons were now covered with tomato stains from the fassolia they were preparing for dinner. Dr. Pappas bowed and asked Yiayia if she would permit them to assist her. She said “thank you, yes” and then these two men flew her up the stairs and let her rest at the entryway to the dining room. There, Yiayia paused and in her most formal tone said “Good night to you, ladies and gentlemen.” The effect of her words made most of the people laugh but the kitchen men and I were too busy swooping Yiayia into the car to pay much attention. My last trip down the Garden State Parkway came about a year and a half later. The Nurses called and said I should come quickly. I arrived in record time and the Doctor on duty said she was pretty bad. I felt squeamish about seeing her but I had to say goodbye and I knew she would want to say goodbye to me even if she couldn’t speak. I walked in the room and her breathing was very difficult. I tried in my poor Greek to tell her that the ride down hadn’t been bad. Her eyes were closed. The room was getting still and I felt like throwing up or running out. A few nurses came in and out and one kindly told me to just talk to her and assure here that it was all right to go and that I loved her. I told Yiayia that my husband was doing well and that we were planning to go to Greece but then some devil in me balked at this mushy farewell stuff. Yiayia was ninety one and had had a good life, she loved me and all her family in her own way. She was uncomfortable and it was time to go. I said “s’agapo,” (I love you) and then feeling very uncomfortable myself I started to hum. Somehow I remembered the words to the Greek national anthem. I stood up, took her hand, and sang out loud ‘Se gnorizo apo tin opsi.” I went through the whole first verse and then repeated it. She opened her eyes and smiled. I smiled at her and said “Yiasou Yiayia.” The Queen had seen me into the world and I was seeing her out. I kissed her on the forehead and left to get some air. I felt she could die peacefully. 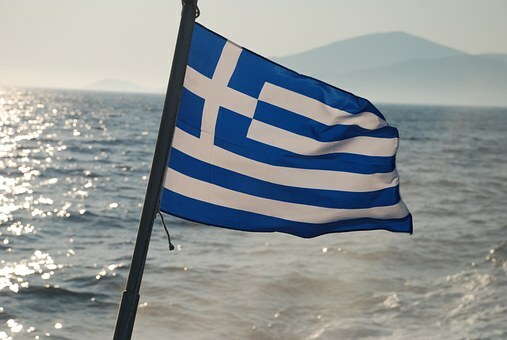 After all, only someone from good family with no monkey business deserves the Greek National Anthem.